Early start was made earlier by the need for a pee at 7am, so after groping around in the dark managed to escape from the van before disaster struck. 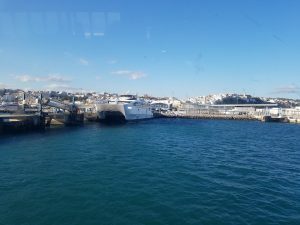 On the 09h00 hydrofoil from Tarifa to Tangier Ville and was at the port by 8am, which is plenty of time. Not the cheapest crossing at 240 euro for an open return but this was only 40 euro more than the cheapest from Algeciras as far as I know. With tales of hustlers, uncooperative policemen and the like, some trepidation about taking the crossing into Africa for sure, but on to the boat. The Rough Guide mentions that for the FRS and Inter Shipping crossings that passport control is done in the Port buildings, but this isn’t the case and soon a long line of people with passports and white entry forms we’re snaked around the boat. Parking the van on the boat I’d noticed a 54 plate Ford Focus estate on the boat and soon met up with Steve and Hillary who are taking part in this years Plymouth Dakar banger rally (they are Team 5). Very much a laid back approach, especially this was with a £400 Ford Focus that had already started cutting out on the motorway down from Santander and hadn’t started without assistance that morning. They’d left Plymounth a couple of weeks early so they could spend some more time on the route, especially Morocco and they were aiming to end up in Banjul, The Gambia. I’d left the van alarm on, so nice to have a Brown Volkswagen mentioned on the tannoy during the crossing, so went back on deck to turn it off (which I thought I’d had). The queue for passport control was still full of day-tripping Spaniards off to Tangier for some cheap Christmas shopping (on a Sunday as well?) 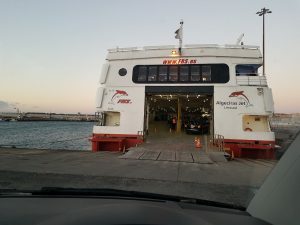 so got to the desk only as boat was slowing up coming into Tangier, but there was no queue. The Ford Focus had started (I’d offered to push if needed) and I joined them with only 5 other cars in the queue for customs and getting the van ‘imported’ into Morocco. Some notes on this operation at the end, but after 30 minutes I was through and into Morocco. Whilst being an Islamic country, Morocco follows the same week/weekend pattern as Europe so the shops were shut, but managed to change 100 euro for Morocco Dirham’s with a guy with an official Inter Shipping jacker; 11:1 on the exchange rate which was okay and turned out to be useful. No one selling SIM cards though and the Maroc Telecom shop I went past was shut. Also, no one selling insurance in the port, but I’d luckily got a Carte Verte (Green Card) from Aviva for 45 days for £70, obtained after spending an hour on the phone. Easy route through town, no sat nav needed, just followed the signs to Rabat and on to the peage. Very quiet roads and lots of green fields (late winter rains in Morocco) and lots of plastic covering vegetables, oranges and banana trees etc. However you can quickly tell it’s Africa as you’re overtaken by a Maserati on one side and you look across to a donkey and cart heading along a dirt route next to autoroute. House and apartment building also maintains its usual standard, though there are nice town houses and apartments being built around Casablanca. I’d not been sure what to do when heading off the boat, but had decided to head south straight away, rather than heading east to Choefchoan and the Rif. A bit more driving than planned but 250 miles in around 4 hours saw me past Casablanca and heading towards El Jabiba, also on the coast. Whilst the Rough Guide report wasn’t stunning, it made a good point to head for and some hotels outside of town including a beer front Ibis (er wow). I did manage to pick up a speeding fine on the way into town, though I wasn’t the only one, so I got a 300 MAD fine (about £24) with an official receipt which was nice. “J’ai habite a Pays de Galle” got the “Ah Gareth Bale” reply, which is no surprise in football mad Morocco (they have qualified for the World Cup next year). All very pleasant with the cops and there were quite a few getting stop also as it was right at the end of autoroute as the speed limit became 80, rather than 120. I’m quite happy I was only doing 102 (and they showed me the speed gun picture). Again, luckily I had changed some money and had enough to pay the fine ! The rival Marrakesh football team was at the Ibis, but plenty of rooms available and for around £30, so cheap enough for me (though a little pricey for Morocco) and a secure bit of parking next to the hotel meant I was sold. It’s one of the few places in town that serves beer it seems but will probably resist. The beach had about 40 relatively serious football matches on it, all being played barefoot; something you don’t see in the UK; says a lot about what football means in Morocco. Next walk along the promenade into town, diving right in to the local culture and life and it was pretty hectic in the market. Was offered a SIM card or 10 but will waiting for the morning and see what deals I can pick up in the shop and get some data loaded also. ATMs aren’t overly common in Morocco, so stopped at a Bank to get some more cash. I’m using a Halifax Clarity card, which doesn’t have foreign transaction charges and regularly comes out on top for overseas use. Sitting in the hotel room and I realise that yes, I’m now miles from home and I’m on my own. Can be a little sobering but also rewarding and it’s you and your initiative that gets you here. You do it your way and you become very aware of your weaknesses and also your strengths. Today I managed to deal with customs and the police in Tangier, navigate without a map to El Jabiba (not hard to be fair) and be pleasant with the cops again when stopped for speeding. Also, I’m in El Jabiba, which isn’t a tourist town for Europeans; I’m the only obvious non-Moroccan around as far as I can see, and whilst this isn’t going to stay this way in other towns on the coast, it can be sobering. What is interesting is that there was no hassle and I was walking around like everyone else. Thanks to my 6 hours of Paul Noble French course on the way down, even ordered a coffee, worked out there was no food on the menu and watched 15 minutes of the football. Can’t be bad as I’m only on Chapter 8 of 36. 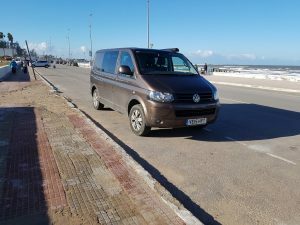 As promised above, quick review of getting the van into Morocco. Tangier Ville port was great; customs guys were efficient and wore uniforms so no scamming or hustling taking place. I was on the early ferry and whilst there were 240 passengers there was only 7 cars and 2 coaches; the boat will probably hold 30-40. I used the online form for the car import, worked really well. Because it was the first time I’d done this, I needed to go over to see the police to register the CIN which was also good; as it was quiet no queues. Steve (on the Banjul run) was the only other person to do it. My limited french was fine for customs and police. They did inspect the van in Spain (closely) and Morocco (less closely) and as has been mentioned, the latter were mainly interested in drones and guns. Took about 30 minutes from driving off the boat to get landside and through. There were no SIM card sellers at the port; whether this is because if was a Sunday, but I got the impression that is normally the case. Money changing wasn’t a problem and I got 1100 dirhams for 100 euro, which wasn’t great or bad. You need cash for the peage as they don’t take credit cards. 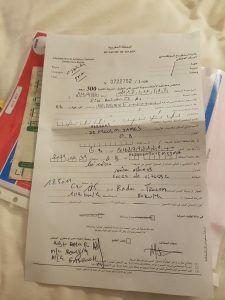 The journey to El Jabiba cost 124 dirhams, so about £10, with about 6 peages involved. Two tickets and the rest fixed price. 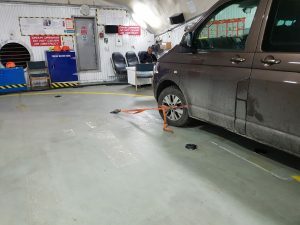 The VW Transporter was charged as a car.